Aranea and Cindy costumes for Hinako and Kaori. 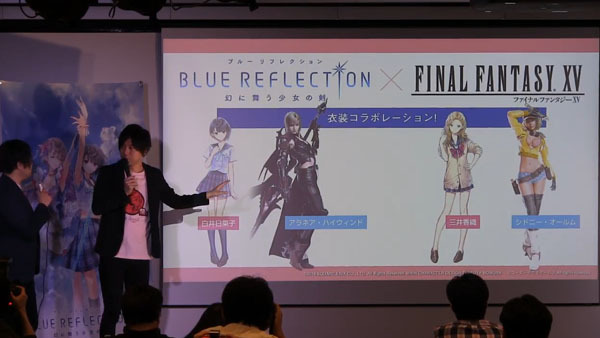 During a pre-launch presentation for Blue Reflection: Sword of the Girl Who Dances in Illusions held in Japan today, Gust announced a Final Fantasy XV costume collaboration for the game. The collaboration includes a Aranea Highwind costume for protagonist Hinako Shirai and a Cindy Aurum costume for Kaori Mitsui. Blue Reflection: Sword of the Girl Who Dances in Illusions is due out for PlayStation 4 and PS Vita in Japan on March 30. Watch the full presentation event below. Around eight minutes of new gameplay footage is shown from 11:46 to 18:58.